You note down the recipe while I head out to scour some more new ingredients to cook with. Note: I have added a lot of recipes on my Facebook page, mostly those which I cook in ziffy for our dinners and never get the time to post on my blog. If you are looking for recipes for weeknight quick meals then you might would like to check them here. Steam the purple potatoes till they are cooked through. Take out and dunk them in cold water. Once they are cool to touch, drain the water and put them in the fridge. This will restore it's beautiful colour. If using normal white potato you can either steam or boil them. I used my rice cooker to steam the potatoes. Cook the Quinoa as per the package instruction. Then let it cool. While these things are getting cooked, Prepare the veggies. Peel and very finely slice the onion in half moon shape. Wash and cut the asparagus in 1/2-3/4" pieces. Chop the bell peppers or capsicum in cubes. Cut tomato and carrots in cubes. 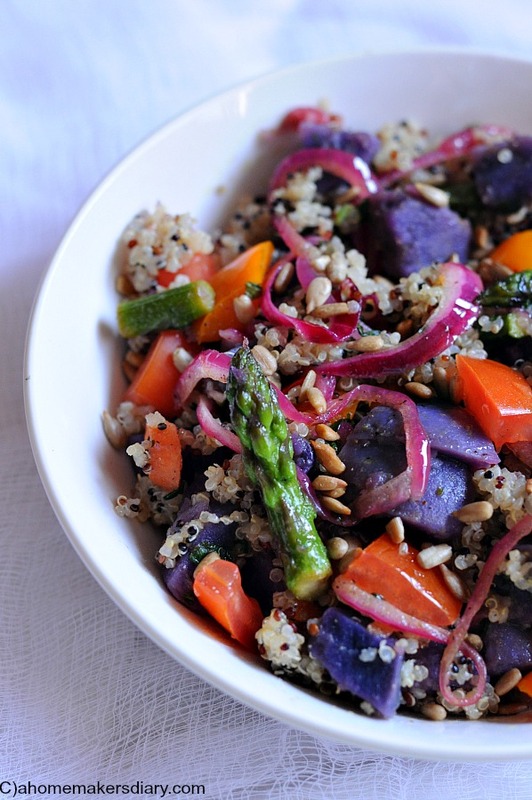 Once the Quinoa cools down, Start preparing the veggies. Heat the oil on medium and place all the asparagus and carrots. Sprinkle little salt and pepper and cook on medium till they are cooked yet retains the crunch. Salad does not taste good with mushy veggies. so cook for 3-4 minutes. Add in the garlic, Bell peppers and coriander powder. mix and switch off the flame. Add the onion, coriander leaves and mix. Sprinkle more salt and pepper. Once it cool down a little bit pour in the lemon juice and and adjust the taste with salt and pepper. dunk in the boil Quinoa in it and give it a good mix. The chopped tomato goes next. Adjust the taste with more seasoning if needed. 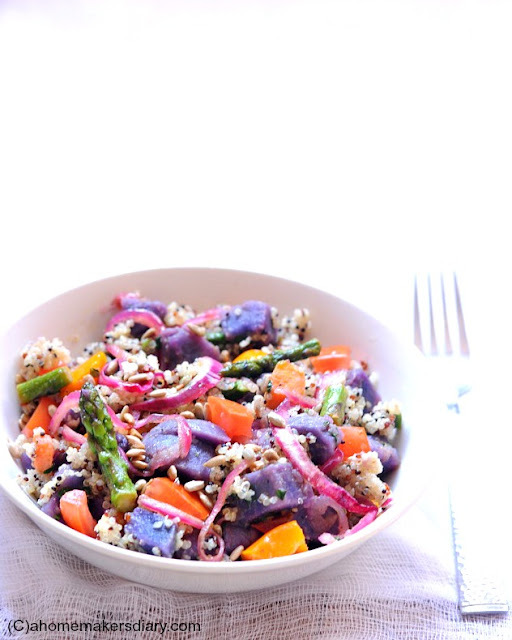 Dish out in individual bowls with a sprinkling of any roasted seeds or chopped nuts. This is the first time I cooked Quinoa and the taste is so similar to Millet. If you have access to Millet then go ahead and use it the same way. To prepare Millet refer to this recipe of Millet Upma. No need to buy asparagus if you are in India like me or any other place where you dont get it, use French beans instead. 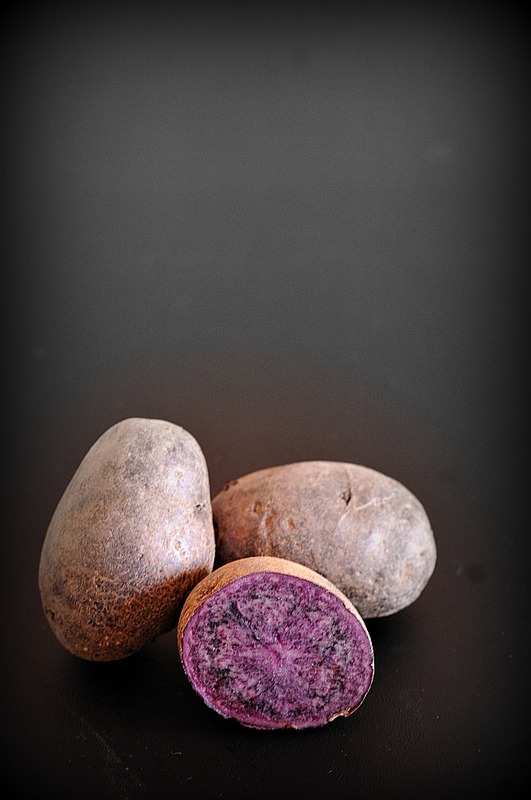 For purple potatoes use normal potatoes. You can add plenty of other veggies like Broccoli, cauliflower, beans, peas, sweet corns, lettuce etc. You can add olives too but i wanted to keep the recipe fresh so did not use any preserved food. 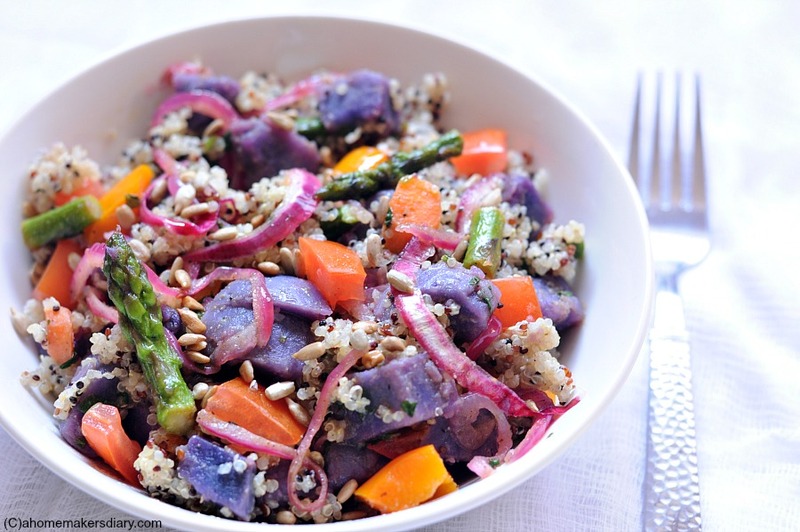 so colorful the salad looks... purple potatoes, hearing it for the first time!